← “Incontrovertible” is it, Rodney? This entry was posted in atmosphere, environment, New Zealand, politics, SciBlogs, science, Science and Society and tagged Climate, climate change, global warming, Intergovernmental Panel on Climate Change, New Zealand, Rodney Hide, SciBlogs, Skeptical Science. Bookmark the permalink. A simple, science-based equation that shows the factors that drive average global temperature is at http://climatechange90.blogspot.com/2013/05/natural-climate-change-has-been.html Using only one widely available measurement set, the equation calculates average global temperatures since before 1900 with 90% accuracy. Added atmospheric CO2 has no significant influence. Dan – have you submitted your paper to a peer reviewed journal? If so has it been published? If not could you summarise the refee’s comments? A big problem I see is that you have not modelled the underlying causes at all well, relying on input of data rather than true modelling. If that is the case I am not surpised at your succes. Or the fact that you don’t improve the model much by adding CO2, it is already there in the empirical inputs you use. But the material in your link is vague and largely unexplained – hence my itnerest on any peer review you have had. A substantially more-detailed version of the work has completed peer review but has not yet been published. The referees understood and agreed with the approach. Comments were mostly to enhance clarity. I think that what you are calling ‘true modeling’ is like the 20 plus GCMs that the IPCC uses. The main problem with those models is that they do not include the most important cause. Then, with their tinkering and training of their models to match history, they set themselves up for the abysmal failure to predict the flat global temperature trend since before 2001. These models used the input data of added atmospheric carbon dioxide. The underlying cause that they neglected to include is the sunspot time-integral. They looked at solar cycle maximums and solar cycle durations, each of which correlate poorly, and decided that sunspots did not matter. Apparently they never thought to look at them together which is what the sunspot time-integral does. It is really quite simple. A low magnitude, long duration solar cycle could have just as much influence as a large magnitude, short duration solar cycle. The sunspot time-integral is the first primary cause. The second primary cause is the natural effective ocean oscillation of which the PDO is a primary contributor. It does not add or subtract energy from the planet and is modeled simply as a saw-tooth surface temperature with amplitude about ±1/5 °K with period 64 years and last maximum in 2005. This simplified method of accounting for ocean oscillations is built in to the equation with only the magnitude being fine-tuned to maximize over-all accuracy. 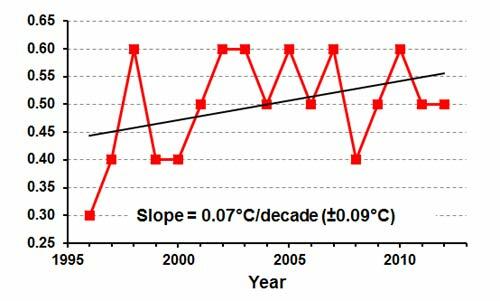 Just these two underlying causes explain average global temperatures since before 1900 with 89.8% accuracy so all of the underlying causes that were not modeled must find room in the remaining 10.2%. It is the input data of sunspot numbers that is the primary underlying cause (the equation format does the numerical integration). Thus the only input data (when the influence of CO2 change is zeroed out) are the sunspot numbers (which are available on the web). The material isn’t vague. It’s really that simple. The climate scientists have become mired in the minutia. What’s the name of the journal it’s to be published in, Dan? I can understand your own preference or your own model, but as I said I believe you are inputting temperature data in one form or another, which will include the influence of CO2. However, your description was vague enough for me to be unsure so I look forward to the full version when published. It’s the CHANGE in CO2 level that is demonstrated to have no significant influence. There is a lot of stuff there but don’t bother unless you really want to find out what caused the planet to warm up, why it stopped warming, and why it is now on a cooling trend. Dan, you didn’t answer my questions. What’s the name of the journal which will publish your paper and when will that be? Looks like Dan went silent. I’m not a climate scientist, whatever that may be, however, I do work in the insurance industry which annually records claims due to extreme weather events and pays out billions in claims for these events. Part of the global warming alarmist agenda is the assertion that CO2 increases cause an increase in extreme weather events and that specific such events can somehow be traced back to humans loading up the atmosphere with CO2. However, if CO2 levels are at or near all-time highs how do global warming advocates account for a fall in 2013 in such insurance claims to $45 from $81 in 2012? That appears to be an inverse correlation, is it not? Surely claims must rise if CO2 levels are increasing. So, what is the truth, and what if the computer models are unreliable and inaccurate? Makes one wonder. 1: What the hell is this alarmist agenda? Certainly the science is telling us that there is a likelihood of increases in extreme weather events and anecdotal evidence also suggest this. But this is a matter of facts and observation – not agendas. 2: No one suggests CI2 atmospheric concentrations have reached all time highs. What we have seen though is increases to record levels in the last few thousand years. 3: As for insurance claims – I have no idea what your figures $45 and $81 mean. However,I would certainly be interested in trends in claim numbers due to extreme weather events. My understanding is that there is a general increase (and we certainly are seeing big increases in premiums) but that would be measured over decades – not over a single year. 4: Computer models are always inaccurate in this sort of thing because of lack of precision and, more seriously, inability to predict economic scenarios.. However, the scientific assessment does produce a predicted range of likely temperature increases and these seem to be occurring. Finally, if you do work in the insurance industry could you obtain reliable long term data (over several decades) of insurance claimed due to extreme weather events? I would certainly be interested in that. Bit data for just 2 years are meaningless. However, if CO2 levels are at or near all-time highs how do global warming advocates account for a fall in 2013 in such insurance claims to $45 from $81 in 2012? You’re in the insurance industry, you tell us. But here is a hint, only in the strange world of Friedman economics and the minds of ACT Party members does the holy market control the laws of physics. This would be a good opportunity for Cedric to post a link to the video about how peer reviewed science works. I’m not a climate scientist…..
We’ve never had someone talk about a science topic like that before. Except for the last zillion times. You two should talk science to each other. The rest of us get to watch and eat popcorn. You two were made for each other. Same stupid, just different labels. I’m not a climate scientist, whatever that may be…. Is English your second language or something? Do you also have the same difficulty with other terms like “electric drill” and “television stations”? Yep, it’s a konspiracy. How spooky-wooky. How does this “agenda” work? Who runs it? What are the nuts and bolts of the operation? Take NASA, for example. NASA is a world leader in climatology. NASA has been telling the world about climate change for decades now. Are they part of this “agenda”? Say it with me slowly. Poor AD. His poor widdle feelings are hurt because I called him a moron and he ran away. Not even a tiny, little bit. I’m in my comfortable place right now. If you don’t want to be labelled a moron then there’s a really easy solution. Stop behaving like them. Another link to the same video? How perfect. Actions speak louder than words. So far, you are just talk. Unless you can do something else other than what the nutters are doing, then you’ll get treated like a nutter. Life is tough that way. What would you like me to do other than just talk? Type, perhaps? You could try not acting like a moron. Did that ever occur to you?